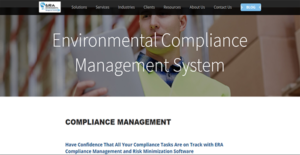 ERA Compliance is a dynamic suite of compliance management applications for mitigating risks and observing industry regulations. The system helps you in ensuring that your facilities are in top form when it comes to health and safety for your organization to achieve full accordance to regulatory bodies’ rules. Because of its automation capability, ERA Compliance can further assist you in ensuring that all compliance-related tasks are on time. The software alerts you when a deadline is coming and automatically escalates an event in case a target completion date is missed to diminish possible risks. With ERA Compliance, you also have access to a module of powerful reports for measuring your organization’s performances against different key indicators. This gives you the ability to gain insightful information on your operations and compliance. Even a single missed deadline can mar your compliance record. To help you avoid such a situation, ERA Compliance automatically alerts you about approaching deadlines for related tasks and activities. This helps you gather your team members for full coordination in fulfilling regulations. Seamless workflows are a key to having smooth operations but that is not all. You also need to minimize risks for your organization to be completely compliant. ERA Compliance can help you with that by providing you with information that lets you fully understand what you need to do for your company to conform to regulations. To make certain that every member of your team is accountable for your actions, it is critical that you have a full view of audit trails. As such, you are wholly aware of pending submissions, upcoming deadlines, and overdue tasks. By knowing these, you can drive assignees to be more productive. For an organization to have industrious and fruitful personnel, it is imperative that every individual is aware of their tasks and responsibilities. Having clearly defined roles let them give their maximum attention to their duties on the job for them to efficiently meet deadlines and follow instructions. If you are considering ERA Compliance it could also be beneficial to examine other subcategories of Best Compliance Management Software listed in our base of B2B software reviews. There are trendy and widely used applications in each software category. But are they essentially the best fit for your company’s special wants? A popular software product may have thousands of subscribers, but does it present what you require? For this reason, do not blindly invest in popular systems. Read at least a few ERA Compliance reviews and mull over the aspects that you desire in the software such as the price, main features, available integrations etc. Then, select a few apps that fit your needs. Check out the free trials of these platforms, read online reviews, get clarifications from the vendor, and do your research systematically. This in-depth homework is sure to help you select the finest software platform for your company’s unique wants. How Much Does ERA Compliance Cost? ERA Compliance is equipped with a host of tools that serve your every compliance need. If you are interested in utilizing the solution for your organization, you can request for custom enterprising pricing by phone, email, or web form. We realize that when you make a decision to buy Compliance Management Software it’s important not only to see how experts evaluate it in their reviews, but also to find out if the real people and companies that buy it are actually satisfied with the product. That’s why we’ve created our behavior-based Customer Satisfaction Algorithm™ that gathers customer reviews, comments and ERA Compliance reviews across a wide range of social media sites. The data is then presented in an easy to digest form showing how many people had positive and negative experience with ERA Compliance. With that information at hand you should be equipped to make an informed buying decision that you won’t regret. What are ERA Compliance pricing details? What integrations are available for ERA Compliance? If you need more information about ERA Compliance or you simply have a question let us know what you need and we’ll forward your request directly to the vendor.